Another day, another fee. 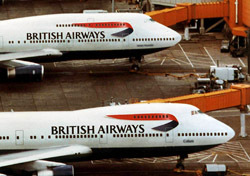 British Airways announced as of October 7 it will allow passengers to choose seats up to 355 days in advance, for a fee of £20 (about $32; check XE.com for current rates) in economy class on long-haul flights. According to the Guardian, the airline is also offering the chance to reserve exit row seats four to 10 days in advance for £50 (about $80). In a bizarre twist on what paying more gets you, business class passengers will have to pay £60 (about $95) to reserve a seat on long-haul flights. Passengers who don’t want to pay the fee will still have the chance to reserve seats for no charge, but not until 24 hours before the flight. Presumably, the pickings will be pretty slim by then. I shudder to think how much more expensive transatlantic travel will get if other airlines also start charging us for the chance to sit next to our traveling companions on these long flights.